The E-Way Bill: Are you ready for the next step in GST compliance? Why is it a good idea to hire outsourced accounting services? Update: On 2 Feb 2018, the CBEC announced that due to certain technical issues, the implementation of the E-Way Bill for inter-state and intra-state movement would be deferred. The E-Way Bill therefore remains in trial phase for now, and the CBEC will announce a date for full implementation shortly. It therefore remains important for sellers and transporters to be prepared for these changes which will likely be mandatory later this year. The CBEC has had its hands full since the implementation of GST in July 2017. Among many changes and announcements, an important one was made in August 2017, mandating that E-Way Bills be generated for all supplies over ₹50,000. This impacts sellers, transporters and even recipients of most goods in India on a day-to-day basis. What is the E-Way Bill and how does it impact your business? Who is liable – you, your customer, or your transporter? What happens when your goods travel first by road and then by rail? We answer some questions. What is an E-Way Bill? An E-Way Bill is an electronically generated document required for the movement of goods of more than ₹50,000 (in a single supply). Currently the E-Way Bill is applicable only for inter-state movement, however it is likely that intra-state movement will also be covered soon. The E-Way Bill includes the vehicle number of the vehicle transporting the goods – therefore creating greater accountability and a transparent trail of movement for the Government. Who is required to generate an E-way Bill? In practice the responsibility is usually the supplier’s, however all parties listed above are legally responsible. What are the scenarios where E-way bills are generated? This also includes capital goods i.e. assets being transferred. What forms must be filed? Once the vehicle number is known and ideally just before the goods are despatched, file Part B which includes transporter details (Vehicle number). Together Part A and B form the completed Form GST EWB-01. Consignor-Consignee Relationship: In this case, the registered person (consignor/consignee) must generate the E-Way Bill on the GST portal by filing Part A and B of Form GST EWB-01. It does not matter whether the goods are being transferred in the consignor’s own vehicle or a hired one, or by rail/air/ship. Goods transferred to a transporter, for transport by road: In this case, the transporter must generate the E-Way Bill on the GST portal. The information in Part A and B of the form must still be filled by the registered person prior to despatch. This applies only in case of road transport through a transporter. What about supplies from an unregistered supplier? To a registered person: It would be deemed that the movement of goods is caused by the registered person. In such case the registered person or the transporter shall complete the formalities of the E-Way Bill. To an unregistered person: E-Way Bill can be generated by the transporter. Upon generation of the E-Way Bill on the common portal, a unique E-Way Bill number (EBN) shall be made available to the supplier, the recipient and the transporter on the common portal. What if goods are transferred to another vehicle in transit? The transporter transferring goods from one conveyance to another in the course of transit shall, before such transfer and further movement of goods, update Part B of the E-Way Bill on the common portal. 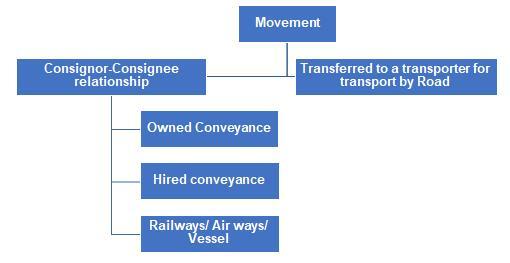 What if one is carrying multiple consignments in one conveyance? Where multiple consignments (e.g. for different recipients) are intended to be transported in one conveyance, the transporter must indicate the serial number of E-Way Bills generated in respect of each such consignment electronically on the common portal. He must also generate a consolidated E-Way Bill in Form GSTEWB-02 on the GST portal prior to the movement of goods. What is the validity of an E-way bill? The validity of an E-Way Bill is linked to the approximate time that transport of goods is expected to take. This is another measure for the Government to be able to track consignments more closely. When does the validity of the E-Way Bill start? When the EWB is generated. What if the validity expires? Where, under circumstances of an exceptional nature, the goods cannot be transported within the validity period of E-Way Bill, the transporter may generate another E-Way Bill after updating the details in Part B of FORM GSTEWB-01. How does one cancel an E-way bill? When goods are either not transported or there is an error in the E-Way Bill, the E-Way Bill may be cancelled electronically on the common portal within 24 hours of generation, either directly or through a Facilitation Centre notified by the Commissioner. However it cannot be cancelled if it has been verified in transit. What documents are to be carried on board? (b) A copy of the E-Way Bill or the E-Way Bill number, either physically or mapped to a Radio Frequency Identification Device (RFID) embedded onto the conveyance in such manner as may be notified by the Commissioner. When is an E-Way Bill not required? (d) in respect of movement of such goods and within such areas in a State and for values not exceeding such amount as the Commissioner of State tax, in consultation with the Chief Commissioner of central tax goods, may notify. Asit Mehta & Associates (AMA) is an established financial advisory firm based in Mumbai, India, with a history of over 35 years. Established in 1982, we are a rapidly growing firm with a team strength of over 55 employees and 3 group firms, all involved in financial advisory services. Please enter your query below and a member of our firm will get in touch with you for an initial no-obligation conversation. © Asit Mehta and Associates 2017. All Rights Reserved.